I sat bleary eyed at the computer waiting on the coffee to beep. Another restless night preceded the dawn. My shoulders sagged, allowing a bent elbow and the palm of my hand to hold up my head. Such was life these days. Facebook called my name, so I aimlessly ventured over. And that’s where my kiss from heaven awaited. My editor, Denise Loock, had sent me a video of Tommy Dorsey and the story behind his infamous song, “Take My Hand, Precious Lord.” I clicked on the link. Immediately, my spirit breathed in the strength of the Lord. Tears flowed. Faith arose. I sat mesmerized as the faith of one who has gone on before refreshed my soul. I can’t wait to share it with you. Be sure not to miss the last three minutes. If you’ve been in a heavy struggle lately, then I’m guessing you’re grabbing the tissues like I did. Did you catch the part where Tommy said after he learned of the death of his wife and child he didn’t know what to do or how to do? Been there. Done that. Feelings of confusion roll in like the ebb and flow of a salty tide. Some days I don’t know how I’ll go forward. Tommy Dorsey felt the same. 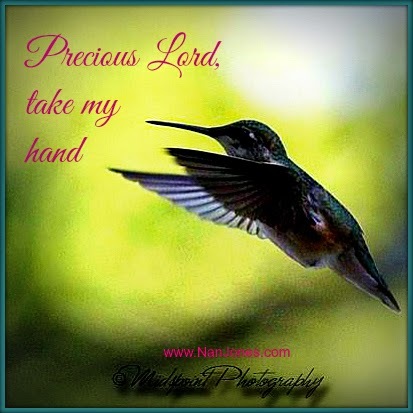 He wrote “Take My Hand, Precious Lord” when he was discouraged and his spirit was broken. Tommy wrote it because he knew in Whom he had believed. I sing it because I know in Whom I have believed. If you received Morning Glory via email, please, please visit the Morning Glory page. If you’ve been struggling lately, overwhelmed by life, I believe this post will help to strengthen you and heal the broken places. Scriptures About Holiness ~ What Do I Know of Holy? There’s Just Something About That Name!